That is a cherry scout!!! I am jealous. 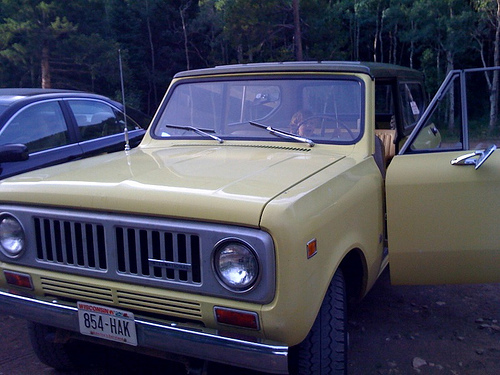 I had a 1972 medium olive green K5 Blazer that I wish I would have never sold. You hit the nail right on the head. You have to slow down in it. I don’t think mine would have done 70. It had 4:11 gears in the axle and physically couldn’t turn any faster. Funny how our fingers get so used to typing certain things that they develop a mind of their own. I’m guessing you deal with virtual machines so much that your fingers are determined to type VM instead of VW. Either that, or VMware now manufactures the Passat and I missed the news. Ahh, he should have taken you to prom in the Scout! Mine gets to 70 once it warms up, but it isn’t happy, and there isn’t a rush anyway! Doh, thanks. amazing how I type X and think I typed Y. My first car in high school (6 years ago) was a ‘72 Scout. At the time I didn’t appreciate it much because it needed a lot of work and I wasn’t that interested in cars. Now, I’d love to get another one as a project car. Well, but I’m showing my age if I point out that Back Then, it was Not Cool to be a geek/nerd. Not that a K-car (station wagon, as I recall) was much higher on the totem pole than a Scout, but Back Then, the Scout was merely oldish and not yet venerable. i had a 74 grand torino 351 cleveland … it was the bomb… i see clint eastwood has a 73 in his new movie …..